36th day in which measurable snow falls. Snow/sleet taper to lingering snow showers into early afternoon in wake of 1-4″ overnight snow. It may still be chilly (19°) but it’s just not too early to test some Spring Yarn! In my many travels, I like to pick up a skein here and there of new fibers especially cotton microfiber type yarns to try out. This is a boatload of something called Jeannee (Plymouth) which I bought online recently. Later on the page the Standards are qualified as Guidelines but I think that that’s quite a GAP when the range of stitches in a category goes from 4 to 5 stitches per inch. Four stitches per inch makes a quite chunky fabric. Five sts per inch makes a noticeably lighter fabric. And there’s another weight right in the middle. Using #7 needles and a yarn that wraps 11wpi I achieve 19sts/24rows over 4″. 19/24 is the ball band gauge of many British Isle & Canadian Aran yarns — so we’re covered by the Standards — and some domestic yarns. Elann, a favorite domestic yarn distributor, posts this stitch gauge on the ball band for their Peruvian Highland Wool and I agree. This gauge makes a quality tensioned fabric and correctly sized stitch for the diameter of the yarn. There’s lots of yarns by Rowan, RYC, discontinued Jaeger, Briggs & Little, and others that ball band to that count. Now here’s the cliff dive #1. I’ve written before that, like the Standards above, the given ball band gauge is just a Guideline. Sometimes it is spot on but other times the manufacturer gives a range on the band that might need further interpretation to optimize the yarn performance. 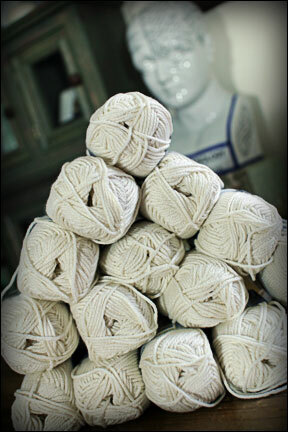 For example, another CK perrenial fave, Cascade 220, lists BBgauge as 18 to 20 sts per 4″. No row gauge is given. However, I bellieve this yarn behaves best at 19sts/24 rows, as above, with #7 needles. 4.5 sts per inch is, IMHO, too loose. 5 sts per inch, too tight. 4.75 sts per inch, spot on. To really see how the stitch characteristics of a yarn change over a range of needles sizes, one can make a 36 stitch Super Swatch that uses progressively: #6 (4mm) needles for 3 inches, than #7 (4.5mm) needles for 3 inches, then #8 (5mm) needles for 3 inches. That will be the next step with my new yarn, but with qualifications. Cliff Dive #2: you’ve certainly read this phrase on many patterns “OR Needle Size Required to get Gauge”. 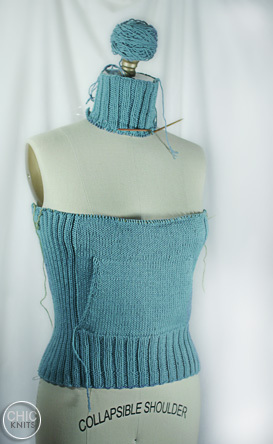 My recent experience knitting both my wool/cotton Eyelet Cardi and the Cotton Fleece Ribby Pulli showed me the beauty of going up and down a needle size to match stitch size when switching from flat knitting to knitting in the round. I also took advantage of Needle Brand/Type to achieve *best fit*. I’ve seen, for example, that a size 6 needle made of nickel gives a different gauge than a bamboo size 6 needle. In addition, I’ve found that wool yarns listed at **sts per inch might behave differently than their suggested equivalent plant-based yarns. So the Cotton Ease I have might knit to the CK worsted gauge of 4.75 sts per inch using #6 needles instead of #7’s or for some folks who’ve knit the Ariann design from CE, #5’s. This is going rather quickly now that I’ve finished the purple Eyelet Cardi. Aye, but does the Cheese Stand Alone!? I always admire those who knit one thing at a time to completion, in fact I adore them! But I know that will never be my future. I exist in the exciting multiproject universe where no number of WIPs is too high! Now, even though I know better, I watch them every d@#% year. This time I even watched the BWalter interview show because I wanted to enjoy the ironic juxtapostion of old school (Harrison Ford/his earring) & new school (M Cyrus and her new upper lip) stylings. “Dear Tilda, I am only one of your biggest fans but I’ve adored your acting for years now. On behalf of Redheads everywhere, thanks for representing. But, after you got the first envelope (uh, the one with the invitation), you might’ve called me! I would’ve dropped everything and flew out to L.A. and gone shopping with you. I know how you must hate it. It was beyond exciting when your name was called but when you hit the stage, it dawned on me! Your dress got caught in your limo door and because you overslept, you had to run for it and both your sleeve and makeup got left in the car!